Fulton County Common Pleas Court will be transformed to update technology and wheelchair access but will retain much of its historical aspects. 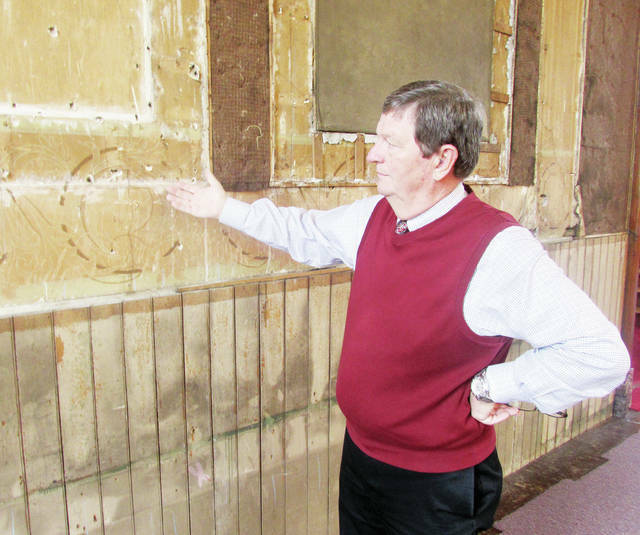 Judge Jeffrey Robinson points out original wallpaper unearthed in Common Pleas Court. The design will be replicated in the renovation. One hundred and eighteen years after the Fulton County Courthouse received its last significant nip and tuck the building is scheduled for a major overhaul scheduled to last a year. By Oct 1, all activities at the 1870 courthouse will cease, and the building will close for an interior face lift and upgrading of the HVAC and technology systems. By the time the work is complete, the second floor Common Pleas courtroom will be restored to more resemble its original look, and other areas of the building will be renovated for both practicality and state of the art technological features. Built just five years after the Civil War, the courthouse retains many of its original and nearly-original features, such as entryways, courtroom chairs, canvas walls, stained glass, marble fixtures, and horsehair insulation. It also claims an outdated 1960s elevator, and recent probes have unearthed original wallpaper and lumber work. Plans for Common Pleas Court include painting and plastering; removal of fluorescent lights; refurbishing the chairs and the wooden barrier between the court area and the spectator gallery; pulling the judge’s bench and the barrier forward several feet; restoring the walls and the luster of the paintings; creating new aisles in the gallery area; adding wheelchair access and equipment for the hearing-impaired; and recreating the courtroom’s original stadium-style seating, using pews to supplement the remaining original chairs and creating seating for about 175 spectators. 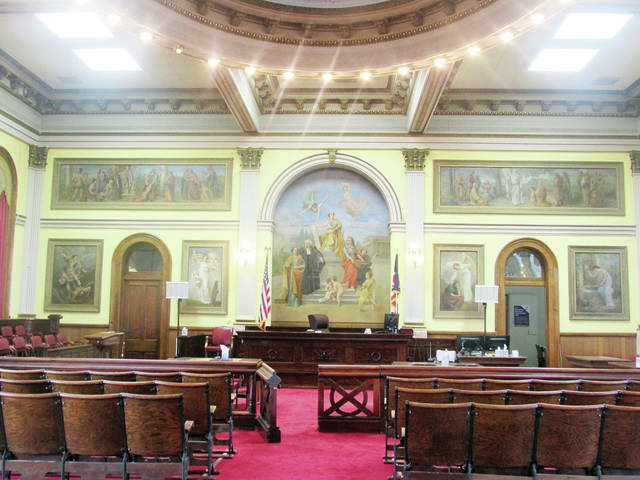 Other changes include replacing light bulbs circling the ceiling dome with more efficient LED lights and returning the courtroom to its original color scheme. Work will be done by Garmann Miller and Associates, an architectural/engineering firm in Minster, Ohio. The estimated $3.84 million cost, plus an additional $332,000 in design costs, will be covered through capital improvement funds, special accounts, and two individual grants from the Ohio Supreme Court for technology totaling $122,080. No bond issues or loans will be necessary. Sealed bids from prospective contractors will be opened Sept. 18. And while most attention will center on the second-floor courtroom and the first-floor Clerk of Courts office, the Probate/Juvenile Court, Magistrate’s Court, and secretaries’ facilities will also undergo updates. The building will get matching carpeting throughout, a $300,000 elevator and a secured entryway, and the Clerk of Courts office will be fitted with bullet-proof glass at the counter. Judge Robinson said much of the project’s expense will be due to new heating, air-conditioning, and electrical systems the county commissioners had already planned for the building. Fencing will be placed around the courthouse during the renovation to forbid access, a move Judge Robinson said will prevent traffic through the building. All courthouse offices will make the temporary move by Oct. 1. Common Pleas Court will be relocated to the county commissioners’ chambers in the county administration building at 152 S. Fulton St. 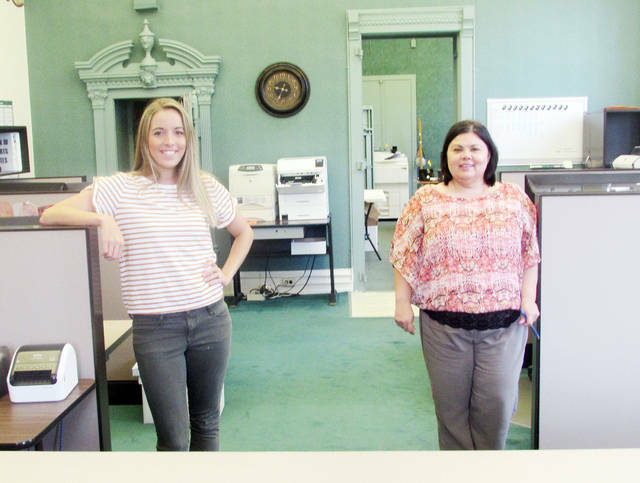 The Clerk of Courts office moves to the Auto Title department in the same building, and Probate/Juvenile Court facilities will take up residence in a vacant building on State Route 108. The project is expected to last one year. Plans to renovate the building had bounced around for decades. The county commissioners and courthouse administrators met in 2016 to mull over possible renovations, and in 2017 Rupp-Rosebrock Inc. of Liberty Center began the process by removing some fixtures in Common Pleas Court. Judge Robinson said the building is still in good condition, and he believes the money used for renovations is well spent. He said it’s one of the few courthouses in the country still standing that is constructed with giant oak trusses rather than a steel or iron frame. “It’s a jewel, and it’s something the people of Fulton County can be proud of, not only now but for a long period of time,” Judge Robinson said. “It’s a very amazing building, and there are very few buildings like this anywhere. Here are my questions. Could I please have replies as soon as possible? https://www.swantonenterprise.com/wp-content/uploads/sites/23/2018/08/web1_courthouse.jpgFulton County Common Pleas Court will be transformed to update technology and wheelchair access but will retain much of its historical aspects. https://www.swantonenterprise.com/wp-content/uploads/sites/23/2018/08/web1_judge-robinson.jpgJudge Jeffrey Robinson points out original wallpaper unearthed in Common Pleas Court. The design will be replicated in the renovation.